In today’s volatile marketplace, modernization of data center facilities has emerged as a competitiveness critical success factor and, if properly executed, a critical piece of an ongoing strategy to better service customers. However, modernization comes at a cost and risks and rewards need to be balanced with available budgets. The scale of risk depends not only on the state of the equipment but also the human resources in place to support that equipment. The less attention paid to the equipment, the more will need to be invested in preparing and training support teams on emergency operating procedures, so that the negative effects of unplanned downtime can be minimized. The data center has to be modified in order to accommodate an organization’s evolving business goals. In an aging data center facility, common issues that need to be resolved include lack of space, inefficient/costly cooling, or a power infrastructure that is not flexible enough to accommodate rapid growth. In addition, infrastructure systems need to be evaluated to determine if maintenance costs are too high or if antiquated systems are threatening the reliability of data center operations. Modernization no longer implies buying a bigger system – For most data center stakeholders, modernization has traditionally meant replacing existing systems with equal or bigger systems at higher cost. However, this “formula” is no longer as common as it used to be. Industry trends such as virtualization, consolidation and cloud computing have considerably shrunk the volume of on premise systems required to run the business. In addition, the new equipment that replaces the old is often much smaller in footprint. Therefore, “more” can now mean “less” (more capacity in a smaller footprint). Hardware redundancy is also not as prevalent because the option of alternative software redundancy via the cloud are now possible. Enhanced data center agility – Rapid data access and connectivity have emerged as critical elements supporting the new wave of mobile and Internet of Things (IoT) devices across the globe. Accommodating these trends requires a radical shift in thinking. Data center assets need to be deployed in an agile manner to support the business. As trends and markets rise and fall, a modern data center physical infrastructure requires both flexibility and constant connectivity. Innovations such as pre-fab data centers and micro data centers are designed with flexibility in mind. Since so many applications have migrated to the cloud, the technology left behind at the “edge” becomes the critical connectivity point for local customers. Edge power, cooling, security and monitoring infrastructures become an important part of the data center agility equation. Lower operations and maintenance costs – Data center physical infrastructure modernization can have a major impact on OPEX reduction. Older UPSs, for example, often exhibit an efficiency of around 90%. Newer UPSs range from 96 to 99% efficiency (the highest efficiencies occur when the UPS is running in the e-conversion mode). Lower efficiencies translate to higher energy costs. When comparing a modern UPS (at 96% efficiency) bearing the same load profile as a legacy UPS (at 88% efficiency), over 10-year period, the cost of losses is nearly $400K more for the older UPS. In addition, the newer UPSs are designed to run much more efficiently at lower loads. Older UPSs are highly inefficient when supporting loads of 50% or less. From a service and support perspective, modernized infrastructures also lower downtime risk. Warranties, availability of spare parts and large pools of technical support skills help to lower downtime driven costs and to provide support staff with enhanced peace of mind. 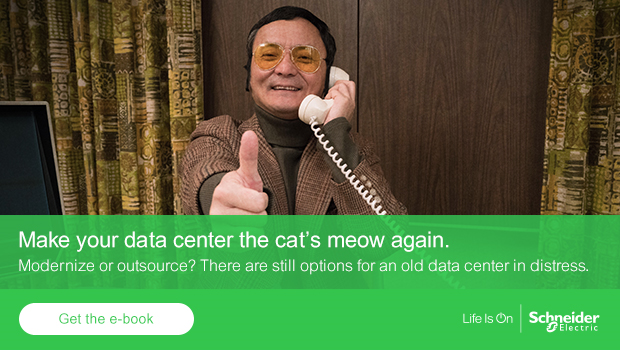 To learn more about data center modernization best practices, download Schneider Electric’s new e-guide, “Modernize or Outsource: Evaluating the Options for your Data Center”.